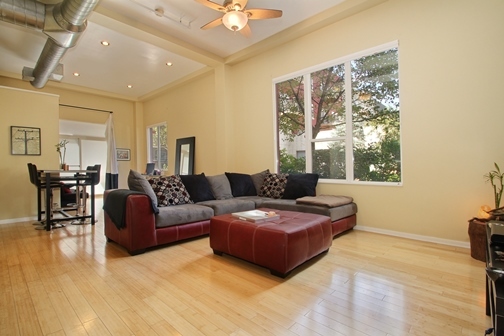 Lush first floor one bedroom condo in the heart of LoHi. This condo has a spacious and open floor plan with plenty of room for a home office/study and 13 foot ceilings. Top-down / bottom-up shades insure plenty of light while maintaining privacy. This home features hardwood floors throughout the living room and bedroom with slate floors in the kitchen and bath, stainless appliances, granite counters and a patio perfect for grilling. Secure building with gated entrance. The location can’t be beat. LoHi is one of Denver’s hottest and fastest growing neighborhoods. The Highlands Bridge over I-25 opened in 2006 changing the face of the LoHi neighborhood. This bridge is one of three bridges that create pedestrian and bike-friendly travel from Union Station to LoHi. Connecting this neighborhood to downtown created a new opportunity for new real estate developments, and hip new restaurants quickly followed. Some of the best restaurants in Denver, with easy walkability to downtown, make this the perfect place in the city. Click here to see all the details and photos.